The Old Mill has limitations of authentic 18th-century architecture and the building is not wheelchair-accessible. There is a considerable grass slope leading up to the mill. Tall steps and narrow doorways may present difficulties for those with physical disabilities. Service animals are welcome to visit the Old Mill. We follow the Federal government’s guidelines on service animals. The NHA welcomes dogs that are individually trained to perform a task or work for a person with a disability, but please leave pets at home. 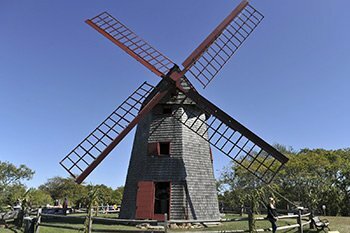 Built in 1746 by Nathan Wilbur, a Nantucket sailor who had spent time in Holland, the “Old Mill” is the oldest functioning mill in the country. 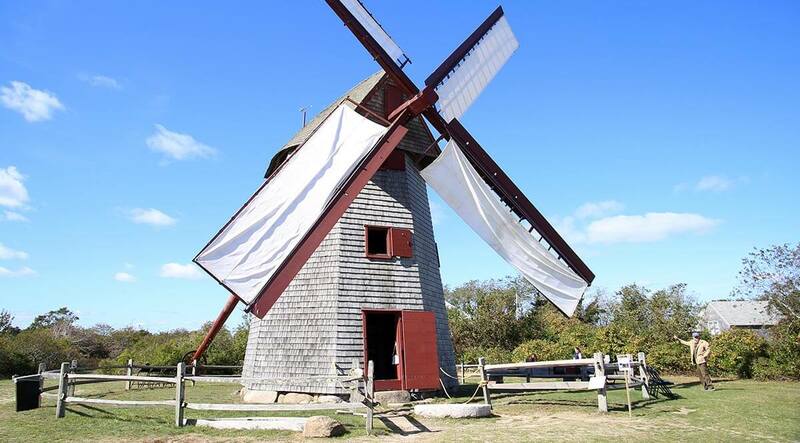 It is the only surviving mill of the four “smock mills” that once stood overlooking Nantucket town. 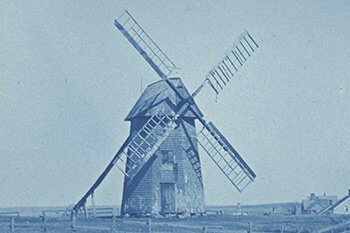 There was a fifth Nantucket mill called “Round-Top Mill” on the site of the present New North Cemetery. The mill was sold once again in 1866 to John Francis Sylvia, a Portuguese miller of Azorean descent, who operated it for many years with his assistant Peter Hoy, until it fell into disuse in 1892. 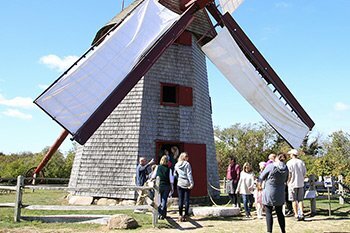 When the mill appeared on the auction block in 1897, the Nantucket Historical Association was able to secure the mill with a successful bid of $885. 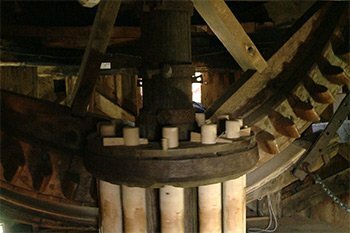 The Old Mill, thought to be the oldest operating windmill in the U.S. in its original location, continues to grind corn into cornmeal today as it did in 1746 when it was built. Hover shows the Old Mill, ca. 1890 (P20249). When wind and weather conditions permit, NHA millers run the mill and grind corn. This video documents a perfect milling day. Today’s millers explain how the mill cap needs to be rotated to best take advantage of the wind direction before the sails are raised. 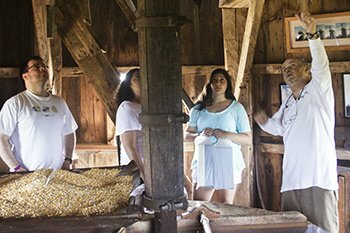 Inside the mill, millers explain the mill mechanisms that allow the mill to turn corn into cornmeal. Hover shows how the gear above rotated by the sails turns the vertical shaft which then turns grinding stone.